The Combat NCO®1911 A2® - a completely new pistol design, patented and trademarked. With 39 new designs and innovations created by Karl Lippard, covered by 11 new US patents (the first new US patents awarded in the 1911 shooting system in more than 100 years), the Lippard 1911 A2® pistol is the world’s most durable, most reliable and most accurate semi-automatic handgun. Significantly, Karl Lippard purposefully designed all Model 1911 A2 and A3 handgun components and parts to fully retrofit and upgrade all existing makes and brands of 1911-style pistols that comply with the original M1911 and M1911A1 design specifications. Thus, most existing 1911-style handguns easily accept the Lippard A2 and A3 New Generation shooting systems. 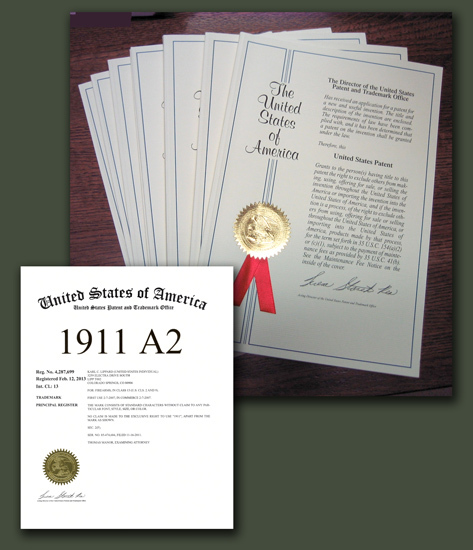 There are 11 Patents issued and 13 patents pending that relate to the 1911 A2 Combat NCO. "Handgun System" filed June 24, 2009. US Patent 8,132,352 B2 Issued March 13, 2012. "Barrel Link for Semiautomatic Weapon" U.S. Patent 7,673,553 B2 issued March 9, 2010. "Barrel Link for Semiautomatic Weapon" US 7,861,640 B2 Issued Jan. 4, 2011. "Process for Manufacturing Double Barrel Shotgun Barrels, and the Resulting Double Barrels" U.S. Patent 7,383,656 B2 on June 10, 2008. Modular Gun Stock Manufacturing System" filed November 17, 2008. U.S. Patent Application Serial Number 12/272,713. "Process for Manufacturing Double Barrel Shotgun Barrels, and the Resulting Double Barrels" US Patent 7,707,761 B2 Issued May 4, 2010. The term 1911 A2 and Combat NCO are trademarked and registered with the United States Patent and Trademark Office.